Home food promos pa chicken mcdo FREE Chicken McDo on Sept 27 for you and your name twin! FREE Chicken McDo on Sept 27 for you and your name twin! But hey! With McDo's upcoming treat, #PaChickenMcDo, having a namesake isn't such a bad thing. Read on! Carlo or Karlo. Mark or Marc. Mary, Merry, or Marie. Do you know someone who has the same name as you? You and your friend are in for a treat if you share the same name, even if they are not spelled with the same set of letters! 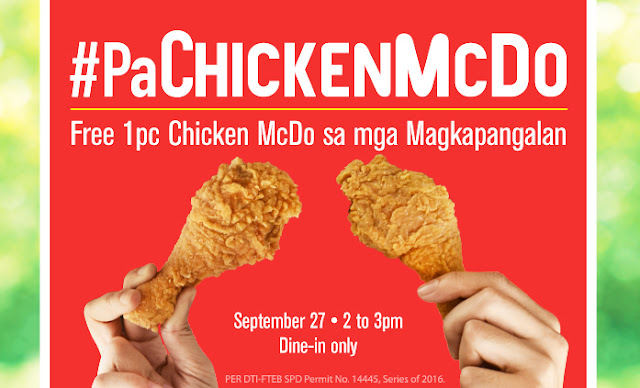 Enjoy FREE 1PC Chicken McDo a la carte for you and your namesake on September 27, Tuesday, 2:00 PM to 3:00PM in select participating McDonald’s restaurants nationwide. Simply bring a valid ID with photo to prove that you and your companion have the same name or similar sounding name. Mark your calendar and invite your friend for this special treat. You can’t resist saying, “McMcMc-Masarap!” with every bite of McDonald’s best-tasting chicken that is marinated, breaded, and fried to a golden perfection! This offer is valid for dine-in only. Check out mcdonalds.com.ph for complete details. Now you can have fun not only by calling each other in the same name but also by tasting the juicier and tastier Chicken McDo. See you Carlo, Karlo, Mary, Marie, Jayson, Jason, Liza, Lisa, Lieza, Paulo, Paolo, and friends! Don’t forget to post your photos enjoying Chicken McDo on Facebook, facebook.com/McDo.ph or tag @McDo_PH on Twitter or Instagram with #PaChickenMcDo.